One thing I like about Bejeweled Beads is that there is something for everyone. Whether you are looking for jewelry like rings or bracelets, a pretty watch, a nice headband or if you are the crafty type, a DIY Kit to make your own watch band, you can find it all here. I hate to say it, but I have gone years and years without a nice watch. The battery died on my old one and I never bothered to get it replaced. This goes back to 2004 so I have been without a watch since then! No wonder I was always late and never knew what time it was! I looked for watches at my local stores, but couldn’t find one that suited my tastes or in my price range. I wanted a watch that was both feminine and pretty and was comfortable to wear. It also has to match with my clothes (which are mainly black, browns, blues and reds). When I was first introduced to Bejeweled Beads, I saw that this company made watches that were my style and were EXACTLY what I was looking for!! Chelsea, the owner and designer of Bejeweled Beads, asked me about kinds of colours I wore to try to figure out what watch band and watch would be most suitable for me. I told her that I wear a lot of black and wanted something that I would be able to wear with all my clothes. She also asked me to measure my wrist so she could make sure the watch band would fit. When I opened up my package from Bejeweled Beads, I saw that Chelsea read me perfectly! The watch band and face fit me to a T! It is so me!! 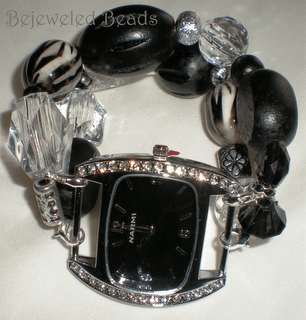 The watch band has chunky black, clear, silver and zebra striped beads on it in various sizes. I love the chunky style of jewelry that is all the rage. 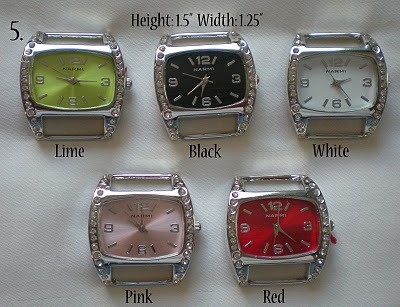 The watch face is black studded with sparkly rhinestones. It is gorgeous!! 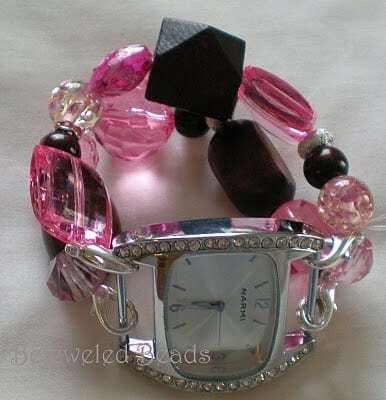 I checked out her website and this particular style of watch I received is called Crystal Zebra. Its hip and chic and matches everything I own. It also fits me perfectly and is comfortable to wear. I now always know what time it is too so this is great for me! The prices are awesome too. A Watch Face is $10 and a Watch Band is $15 so a total of $25 for my new watch delivered right to my door. Actually, all Bejeweled Beads prices are good. Â They beat many stores and the quality is much better. Plus, who doesn’t love handmade? I like that you can mix and match with the watch faces and bands so I could buy more bands/faces if I wanted to change up my look. The watch face easily attaches to the bands so switching is so simple. If you are interested in making your own watch band, you can with one of Bejeweled Beads DIY kits to help guide you through the process. Â If you already know how to make them on your own, you can also purchase beads at wholesale prices. I am not at all crafty so I know that I would want Chelsea to make mine for me. However, it is nice to know that option is out there for people who have more talent and patience than me! 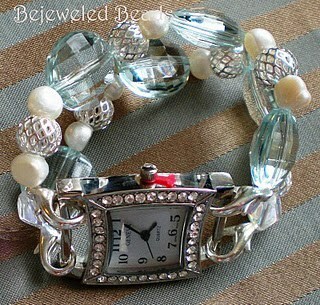 Visit Bejeweled Beads and see all they have to offer. 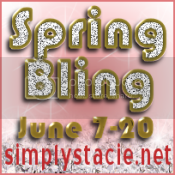 Check out the amazing selection of watch bands while you are there too!